I purchased a Xerox WorkCentre 6015 printer in August and fitted non-genuine cartridges. It jammed and stuck to the machine on a photo and Xerox stated it was because the non-genuine cartridges didn't have the wax content. Their cartridges are almost as much as the cost price of the machine. I would like to purchase a set of compatibles from you but I'm worried the same thing will happen as Xerox refused to replace it? The Xerox WorkCentre 6015 series offers several competent colour MFP models that provide excellent productivity and all around performance for any workgroup. The base model offers standard 1200 dpi printing, colour scanning, faxing, and copying, while succeeding models offer network capabilities, wireless networking, and automatic duplexing. The Xerox WorkCentre 6015 multifunction printer delivers 15 black pages and up to 12 full-colour pages per minute. The Workcentre 6015 laser multifunction printer is built for heavy duty work, capable of handling 30,000 impressions per month. However, the Xerox 6015 printer is easily beaten out by comparable inkjet printers in terms of print quality and print speeds. For a business printer, the Xerox WorkCentre 6015 printer is unexpectedly stylish, featuring a white finish with a dark blue control panel and paper tray. The layout, however, is pretty traditional, with a front-fold down panel that reveals the paper tray and 10-sheet multimedia feed. There is a monochrome LCD screen to check for printer status, while the control panel includes a numerical keyboard for inputting copy quantities and dialling fax numbers. The Xerox WorkCentre 6015 colour laser printer has versatile connectivity options, including standard USB and Ethernet connectivity. Even a wireless interface is available as an upgrade. There is a second USB port in front which can be used for scanning directly to USB memory keys or printing directly from them. Maximum print resolution is up to 1200x2400 dpi and the WorkCentre 6015 laser printer has standard Ipv6 security features. Compatible Xerox WorkCentre 6015 toner can be purchased for this model to drive down costs and give users of this printer a discount on toner refills. 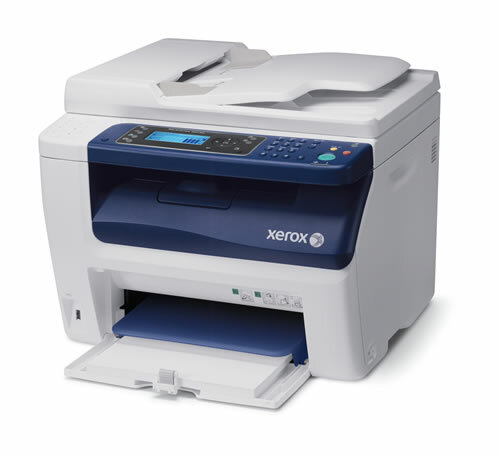 The Xerox WorkCentre 6015 colour multifunction printer is a very capable device. However, there are much cheaper inkjet devices that can do all the same tasks for a lower asking price and more affordable running costs.